| The Movie of My Childhood, and Still Today. The couple sitting next to the aliens when they steal the talents of Barkley and Ewing are Patricia Heaton and Dan Castellaneta. During the scene in Madison Square Garden, The court goes from having only the professional three point line and an orange lane, later on in the scene, there are two three point lines, college and professional, and the lane is now blue. 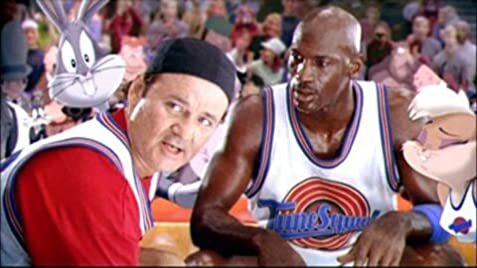 After the credits, various characters quarrel over who gets to say "That's All Folks", then 'Michael Jordan' says "Can I go home now?" Then the Looney Toons "That's all folks!" written text slides over. Available on home video in a slightly longer director's cut.